A Title Blue Tantrum affixed to a blue 1/16-ounce mushroom-style jig. In our gear guide about Riot Baits’ Relic, we noted that we had failed for several years to keep Midwest finesse anglers up-to-date on the various soft-plastic baits that Riot Baits has created. Therefore, it is necessary to publish gear guides about the Baton, Probe, T3 Tattle Tail Swimbait, and Tanturm. This one focuses upon the Tantrum. To help us in our endeavor to publish a gear guide about it, Riot Baits sent us 20 of them to experiment with and examine. It is a 2 3/8-inch creature bait that Midwest finesse anglers will affix to a small mushroom-style jig with an exposed hook. The combination of the Tantrum’s head and torso is 1 7/16 inches long. Its head possesses the shape of a curvilinear triangle, but its dorsal area is more convexed than its ventral area. It is five-sixteenths of an inch long, and at its junction with its torso, it has the circumference of about 1 5/16 inches and a width of three-eighths of an inch. From the tip of its posterior to the junction of its head, the torso is 1 3/16 inches long. It is encircled with 12 significant ribs or segments. Its ventral area is somewhat flat, and its dorsal area is convexed. It is three-eighths of an inch wide at its widest spot with a circumference of about 1 5/16 inches. It has two large appendages, which are flat and claw-like. Each appendage radiates from the side of the torso’s third and fourth ribs. When they are fully extended, each of these appendages is two inches long, and when they are at rest, they are about 1 1/2 inches long, and they are three-quarters of an inch wide at their widest spot. Most of the surface of these appendages is embossed with minor ribs, and the underside of one of them is engraved with the word Riot. The topside and underside of the front two-thirds of each appendage is adorned with a ridge or a scalloped flange that is 1 1/8 inches long and an eighth of an inch high at its highest spot, which is at the tip of each appendage. The purpose of these ridges or flanges is to accentuate the gyrations of these two appendages. In essence, they are an abstract rendition of a crayfish’s claws, and the tips of Tantrum’s claws are adorned with two triangle-like features. The tip of its posterior is somewhat flat with an indentation to accommodate the collar of a jig. It is a quarter of an inch wide with a circumference of three-quarters of an inch. It is available in the following colors: Blue Steel, Green Pumpkin, Money, Orange Crush, Riot, Sapphire Blue, Slayer, and Tidal Blue. It is manufactured from a flexible but durable soft plastic that is impregnated with salt. It is not buoyant, and when it is not affixed to a jig, it falls in 71-degree water about 12 inches in six seconds. A package of 10 costs $4.99. (1) Here is the link to Riot Baits Fishing’s website: https://www.riotbaits.com/product/the-tantrum/. (2) The Tantrum was primarily designed for anglers to affix to a skirted jig like Riot Baits’ Lil’ Creeper Jig or its Minima Jig, which according to Riot Baits are some of the industry's smallest skirted jigs, measuring two inches in length. But Midwest finesse anglers will opt to use it on a skirtless mushroom-style jig with an exposed hook. It is interesting to note that since the Tantrum was introduced to the angling world, the staff of Riot Baits has discovered how effective it is when they affix it to their Panic Button jig, which is a mushroom-style jig. In short, it is an excellent size and format for Midwest finesse anglers to employ with all six of the standard Midwest finesse retrieves or slight variations of those retrieves. For insights on how to execute those retrieves, please read the Midwest Finesse column at this link: //www.in-fisherman.com/midwest-finesse/six-midwest-finesse-retrieves/. 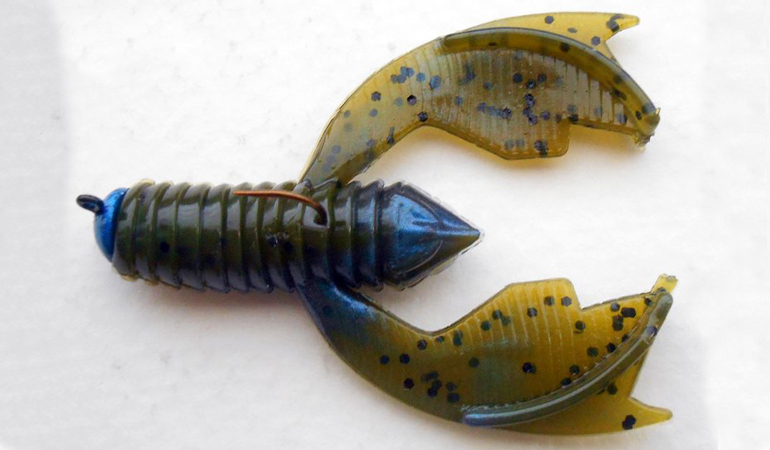 One veteran Midwest finesse angler described the Tantrum as a fat and short stick-style bait that is adorned with two claws. Of course, a small stick-style bait has been part of our repertoire since the heydays of the great and late Chuck Woods of Kansas City, Missouri, in the 1950s and into the 1970s. And a short stick-style bait with claws has been part of our soft-plastic repertoire since Guido Hibdon’s family created one in the 1970s. We are always looking for a new rendition of Woods’ and the Hibdons’ creations, and so far, the Tantrum looks to be one in several Midwest finesse anglers’ eyes. In its construction and in the way it can be used, the Tantrum is a remarkably simple bait, and this veteran angler noted that simplicity lies at the heart of Midwest finesse endeavors. (3) Here is a link to a Midwest Finesse interview with Matt Stark, who is a proprietor of Riot Baits: //www.in-fisherman.com/bass/riot-fishing-interview-matt-stark/. (4) Here is the link to our Feb. 17, 2015, gear guide about Riot Baits' Urami Worm: //www.in-fisherman.com/bass/riot-baits-urami-worm/. (5) Here is a link to our Nov. 15, 2018, gear guide about Riot Bait’s Relic: //www.in-fisherman.com/editorial/riot-baits-relic/328290.